Wheelersburg sophomore Mallory Bergan attacks the net for the Pirates. Wheelersburg players and coaches pose with Ellie Ruby (#10) after the game to celebrate her accomplishment of 1,000 career digs. 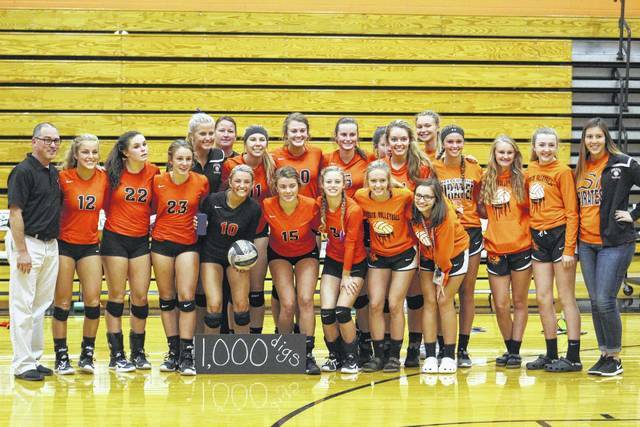 There was plenty of excitement in the stands at Wheelersburg on Monday night as senior libero Ellie Ruby recorded her 1,000th career dig in a match against Raceland. Ruby entered the contest with 987 digs for her career. The historic dig was achieved in the second set, and Ruby received a standing ovation after the Pirates scored. There was some confusion on the sidelines as Ruby neared her mark, but once she got close she couldn’t ignore the numbers anymore. “I was back to serve, and I happened to look over at my coach at the serve positions and I saw 999 and I was like “alright, next ball”,” Ruby said with a smile. Wheelersburg volleyball head coach Allen Perry was excited for Ruby, and gave credit to her former head coach for the feat. Perry says that Ruby is one of the nicest people off the court, and one of the hardest working on it. She often goes above and beyond to be there for her teammates and peers. For Perry, Ruby was the leader that he hoped to have in his first season as Wheelersburg’s coach. Amidst all the chaos, there was still a match to be played. Raceland was able to hang with Wheelersburg in the first set, but the Pirates pulled away later on in the match. In that first set, things were deadlocked at 11-11 early on. From there, Wheelersburg went on a 6-1 run before Raceland head coach Sarah Linn took a timeout. After the timeout, Raceland was able to make a push of their own, and even drew within a point when the score was 19-18 late in the set. The Pirates were able to pull away towards the end of the first set, scoring four of the last five points to take command and grab a 25-21 victory. In the second set, Wheelersburg relied on several more runs to give themselves a cushion. After trailing Raceland 2-1 to start the second set, the Pirates surged to an 11-4 run before Linn took a timeout with her Rams trailing 13-6 early. The Rams were able to draw a bit closer with the score at 16-10, but Wheelersburg used a 9-4 push to claim the second set by a final score of 25-14. 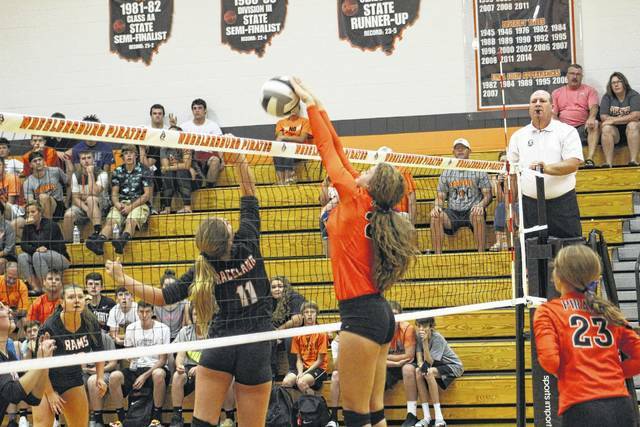 In what was the final set, Wheelersburg won once more by a count of 25-14. The Pirates relied on a 10-3 run at the end of the set to pull out the win over Raceland in straight sets. The defensive effort was led in large part by Ruby, who recorded 22 digs in the game. Ruby also recorded 17 service points. Sophomore Alli McQuay made her presence felt offensively for the Pirates, with 10 kills, five digs, four aces and 14 service points.